This 100% singletrack trail system starts with prime hardwood forest riding on the north end, but transitions into beautiful pine forest riding towards the sourthern reaches of the property. Highlights include a desert-like slickrock section and a rock bluff overlook. Glade Runner is a 7 mile loop blazed in green. There are 4 additional, more difficult loops each about 1 mile long, which branch off the main trail. They are blazed in blue: GORT (Good Ol’ Rocky Top), Randy’s Crack, Amateur Hour, and Upper Cut. The gravel/paved Ironworks bike path may be used to shorten a ride or create a different one by bypassing some areas. The trail now includes a one-way downhill flow trail constructed with the assistance of Trek Bicycles. None at trailhead. Water available across HWY KK at the Ironworks Path Pavilion. Plenty in St. James. 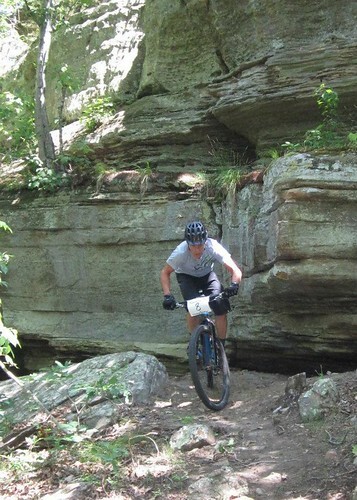 Funded mainly by Route 66 Bike Shop in Rolla, the Forest City Trail should be fun for all levels of rider. Construction began in winter of 2009/2010. 4 additional technical loops were added in 2010-2014. Pine section a little soft. Hike it if you're cutting ruts. 3 trees down which need chainsaw, so heads up! Too much freeze/thaw. Trail is very greasy. Decent, with a couple of wet spots through the pines. Mostly just damp with leaves for the most part! Softer than I was expecting, The south pine area was the worst but not leaving tracks. Deceptively slimy yet firm in a few areas that will catch you off guard. Otherwise a great and challenging trail.